especially when Madhuri Dixit was at the peak of her career. you will find people who will watch those videos. And if this face can get 1 Lakh Subscribers, so can you. 1. 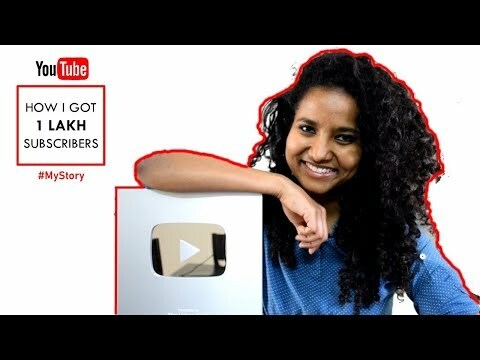 My journey, what all I had to do to get 1 Lakh subscribers. and the initial investment that I made to start this channel. to tell you what really happens behind the scenes. Because now that we are family, I don't really want to hide anything from you. because that motivates me to make more videos. On 6th August 2016, we released our first video. It took us 18 months to reach 10K subscribers. And just 6 months to go from 10K to 1 Lakh subscribers. And just 1 month to go from 1 Lakh to 1.58 Lakh subscribers. to see exactly what happened? And for that I've divided my YouTube journey into 6 phases. used to ask me how to workout instead of asking the trainer. So I thought why not make a YouTube channel out of it. And thus began The Urban Fight. and in between as breaks, Sugandh would read out the daily news. So workout + daily news update. Great idea, right? I noticed that dance videos used to get a lot of eye balls. Plus it's a great workout. that I can legally use the word, 'Zumba', in my video title. we got our first 500 subscribers. I am 'dancing on the Internet' and all hell broke lose. Dance videos were doing great, but I felt that we are not really adding value to our subscribers. but make 'okayish' videos. So people want you to make videos for them.....for free. and I was desperate for that outreach. instead of discovering what videos I like to create. This was the time when I wanted to discover who I am and what I enjoy doing. So I tried different genres. where I invented a sassy character called Afreen Aapi. This was the video that made me realise why I should never do comedy. During this phase, we were still stuck at 2000 subscribers. "People have turned up in lakhs for this guy..
...and you still don't have 2000 subscribers." determined me to pursue this even more. but I was not connecting to my audience. I was giving information but there was no emotion. This was the time when we decided...let's make videos that have affected me! And that's when the channel became Female-Centric. It's not because I don't love guys. I do. My husband is a guy. So I started talking about Periods, Eve-Teasing. where the YouTuber interviewed her mother who was a Gync. But it didn't answer all the questions that I had. request her to do a video with me. and this is one video that I am extremely proud of. but nobody really offers any solutions. Eve-Teasing, Domestic Violence, Sexual Harassment, Child Abuse and more..
you might just save someone's life. when you are not healthy here (in the mind). And 'here', career and money are the biggest worries. Mutual Fund videos, Career Videos. because that's when you and I became friends. your life goals with me. And that's the community I want to build. Of go-getters. People like 'you' who work hard to get what they want. So those were the 6 phases of The Urban Fight. But the phase that I always want to be in, is the experiment phase. who needs those last 2 vertebrae right? Anyway, so that's the journey that you see on-screen. to get 1 Lakh subscribers. These 3 stories made me the YouTuber that I am today. Story #1: I am a Software Engineer by profession. 4 years of Engineering and 8-9 years of Corporate experience. But if you go to the gym, doesn't mean you are qualified to give health information. by Doctors and Fitness Coaches. so that I get the experience of training people. and not make any random 'Keto Diet' videos. and conduct free 15 Min workout sessions. This is Kashif, he used to join sometimes to help us conduct the sessions. while I conducted 15-15 minute sessions for 2.5 hours. while we requested them to join. but it taught us a lot about human behaviour. hoping that their friends will watch it. and she was kind enough to share our video on her page. We did it because no other YouTuber wanted to do a collab with us. And why would they? We were in our 1000's. during a meet and greet and gave her a script. that even though the girl had 8000 subscribers, she still did that collab with her. I thought, what a brilliant idea! So we went to attend a Creator Camp, all the way to Delhi. I thought I'll take a script for that one YouTuber that I loved. and I went to her. told her how much I love her work and I gave her the script. She didn't even look at it. asked me to mail it and walked away. but you atleast treat a fan right. I came back to Hyderabad and I did that video anyway. And that was the first video to hit 1 Million Views on my channel. I probably want to do a pelvic thrust right now, but I shouldn't. So that was my journey. Speaking of rejection, we are not done yet. so that they create better content. You can apply only if you have between 10K to 1 Lakh subscribers. you are working hard and doing good work. until the applications open up. and this is the mail I got last week. "Unfortunately we cannot offer you a winning spot"
It's not about the training or the money. So if you want to start a YouTube channel and want to take anything from my story, it's this..
or the likes or the subscribers. Youtube is a long ride in the night on a road with no street lights. making videos that I believe are making a difference. And the second and the most important point of being a YouTuber is this..
Stay loyal to your subscribers. Don't sell things that you don't believe in. and you are a part of my family. the trust they have in you, is worth a lot more than any money that brands can give you. So always remember these 2 things while you are on your way of getting 1 Lakh subscribers. And finally, here's the equipment that I use. and a Mackbook Pro for editing my videos. I have left their Amazon links in the description. You might ask, what's next? a new love and relationship channel. I don't know. Comment and tell me what do you think I should do. Because on this scary YouTube road, you are my street light. because this silver play button would have not been possible without you. Thanks for believing in us, when nobody else did. and hit that bell icon. We promise to see you again next week, until then..
Keep fighting, The Urban Fight to be Fit!